Hiba Ghaith is a pioneer in the field of women’s fitness in the city of Ma’an. At the age of 35, with a growing family of her husband and four children and very limited employment options available to her, Hiba convinced a microfinance institution to give her a 13,000 JD loan with her proposal to open the first certified ladies’ gym in her city. The initiative of the EU and BMZ, implemented by GIZ, contributes to improving the access to finance for hard-working small-business owners like Hiba, thereby supporting growth and employment generation. Hiba’s journey with sports started at the age of 14. She played on the basketball team of her school from 8th grade and all throughout high school. After high school, with little finances to support herself, she managed to enrol in university through an athletic scholarship. “Being an athlete helped me get into university and get an education. I played for all the sports teams in university and I competed in all the games. That’s what got me through it.”. In 2014, it was both luck and preparation that led Hiba to take part in a competition of business ideas by one of the leading microfinance companies. She had saved 2,000 JOD by then and was looking for financing from charity and community organisations but without any success. “I was so excited to read the announcement. I couldn’t believe that I was so close to making my dream a reality.” says Hiba. The judges were impressed by her mission to empower the women community in Ma’an. She received a loan of 13,000 JD that she had to pay back over a 3-year period. From there, Hiba and her husband worked together to make this dream of a ladies gym become reality. They rented a two floor space, bought exercise machines and hired a receptionist and a nutritionist. “The top floor is dedicated for aerobics classes and the lower floor for exercise machines and nutrition consultations.” says Hiba. As for her future plans, Hiba has great ambitions. 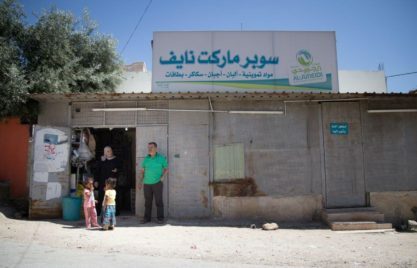 “My dream is to open more branches of ‘My Fitness’ in other cities, such as Shobak, that don’t have gyms for women.” She still needs to develop her new business in Ma’an before embarking on new ones. Yet, she dreams big. “The women who come to the gym have been asking me for a while to add a swimming pool to the gym! Do I think Ma’an is ready for that yet?” She pauses with a smile on her face. “I guess I’m going to find out”.